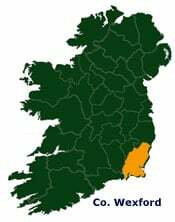 Forming the southeast corner of the island, County Wexford is Ireland’s gateway to the rest of the world – and has been since the earliest times. Wexford boasts the country’s richest agricultural land and some of the most spectacular scenery. From the brooding Blackstairs and Wicklow Mountains along the county’s western and northern borders to the miles of golden beaches in the east, from the lush pasturelands of the Slaney valley to the wild, Atlantic-swept rocks of Hook Head, Wexford offers an unequalled variety of landscapes. And Wexford enjoys more hours of sunshine than any other part of Ireland! It’s county’s nature reserves are of worldwide importance. The county’s long coastline and rivers afford incomparable sea and game angling, as well as scuba diving, pleasure boating and other water sports – not to mention sea-fresh ingredients for the county’s dozens of award-winning Restaurants. Wexford has some of Ireland’s finest Golf Courses. It’s four main towns and countless picturesque villages host a warm, welcoming and thriving nightlife, which ranges from the traditional Irish music pub to the high-energy nightclub. County Wexford boasts 200km of coastline on two seas, with miles and miles of unspoilt golden strand and secluded coves and we can promise you a holiday to suit all levels of taste and activity.